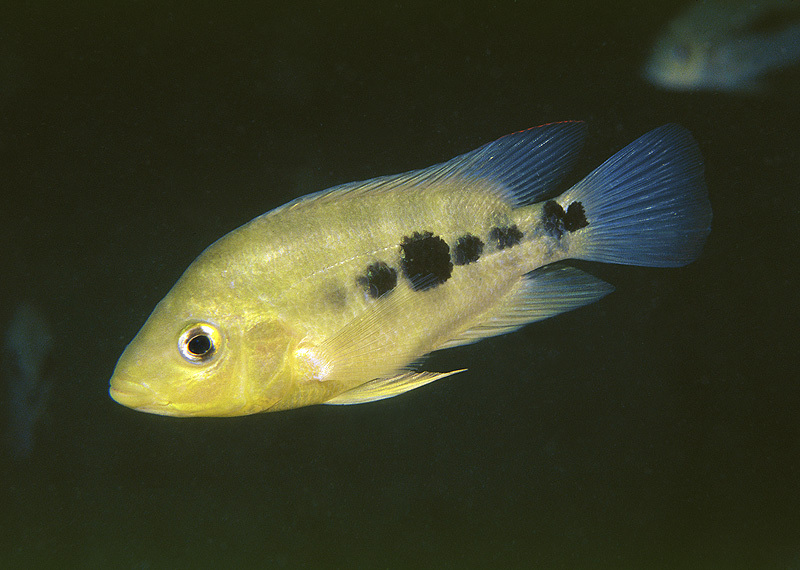 The Midas cichlid (Amphilophus) species flock is composed of several species, and the research group at Estacion Biologica has been working on describing new species in the group. 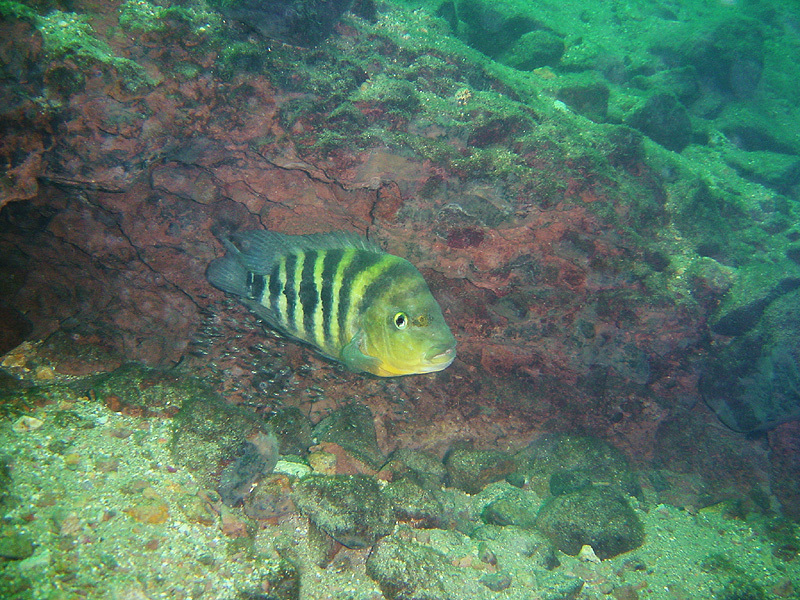 The largest of the Midas cichlid complex found in Laguna de Apoyo is the mojarra chancho, Amphilophus chancho Stauffer, McCrary & Black 2008. It is named after the Nicaraguan local name for pig, for its corpulent appearance. Mojarra chancho in breeding coloration. Photo by Adrianus Konings. Like other Midas cichlids in Nicaragua, the mojarra chancho find mates near breeding areas, then establish a breeding site with a natural or dug hole. They usually make nests at between 12 and 25 meters depth, in areas of massive nesting. The parents are sequentially monogamous, with both male and female staying on nest to care for the fry around forty days after free-swimming. 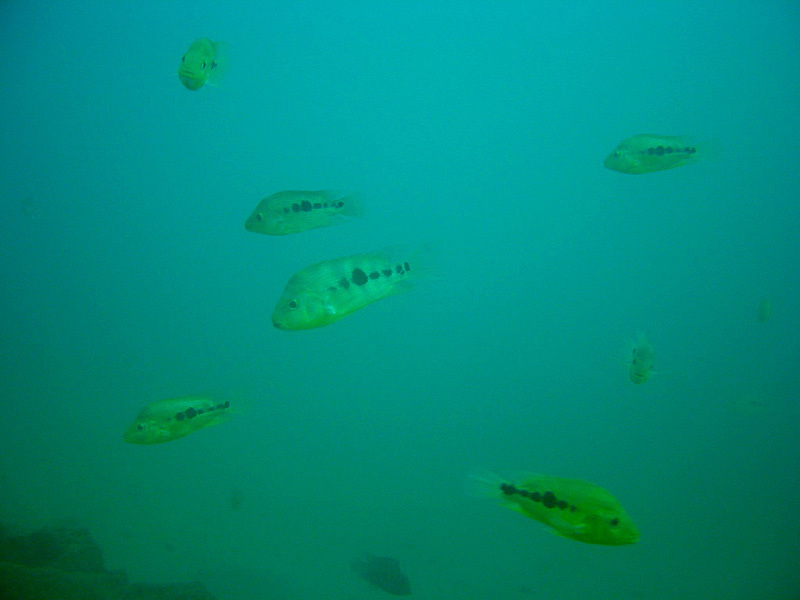 Juvenile mojarra chancho. Photo by Adrianus Konings. The mojarra chancho can be as large as the large-mouthed predator in the lake, the jaguar cichlid (Parachromis managuensis). 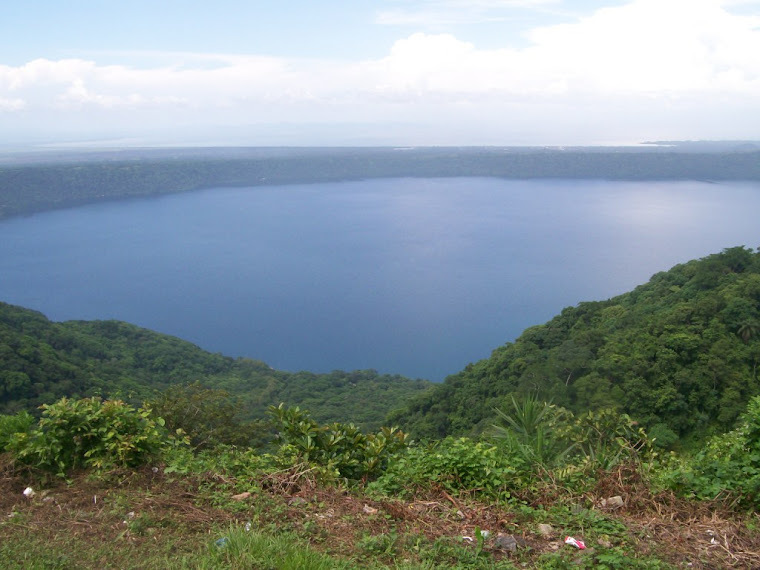 Its only habitat is Lake Apoyo, Nicaragua, where it evolved sympatrically with a least five other members of the Midas cichlid species complex. This species is distinctive among the crater lake cichlids for its size and behavior: notice two of the fishes in the photo below, looking at the photographer with both eyes! Schooling mojarra chancho maraud in search of prey. Photo by Adrianus Konings. Breeding is common from November through March. When not breeding, the fish may form monospecific schools and maraud the lake for prey. One of their most notable prey is the eyes of fish that have become blind by cataracts. 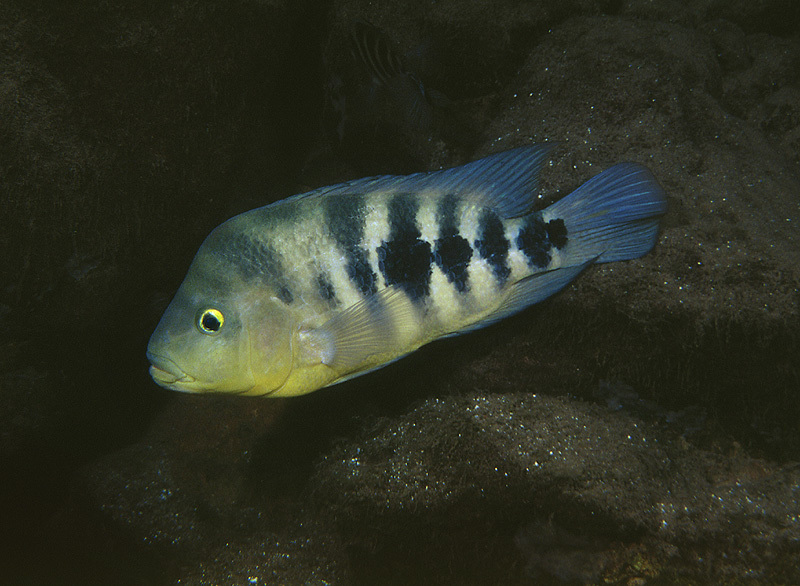 The conservation status of Amphilophus chancho has not been evaluated, but we expect it to receive status as an endangered species, given that its range and population are similar to those of the arrow cichlid, Amphilophus zaliosus, which has recently been declared Critically Endangered. Mojarra chancho female with fry. Photo by Adrianus Konings. Our SCUBA diving program has helped us determine that this is indeed a distinct species and to develop information about its ecology. We see several individuals each time we dive, and nests are not uncommon during the height of nesting season. By diving with us, you get to see some of the most interesting of animals in Nicaragua, in the water! If you are a certified open water diver, you can participate in a dive with us and help us learn more about the endemic fish species in Lake Apoyo. For more information on how to help us study this fascinating fish, please contact us.